We’re delving back a long way into London’s history here to the Anglo-Saxon period when London was known as Lundenwic. Credited as the first bishop of London in the Anglo-Saxon period, Mellitus is perhaps most famous for having founded the precursor to today’s St Paul’s Cathedral. Tradition holds that Mellitus was a priest – perhaps an abbot – of noble birth who was among a group of missionaries, known as the Gregorian mission, sent from the monastery of St Andrew on the Coelian Hill in Rome to England by Pope Gregory the Great in response to a call from St Augustine – the first archbishop of Canterbury – for people to help convert the Saxons to Christianity. The mission was dispatched to England in 601 AD (apparently Mellitus brought with him a number of books, including possibly the St Augustine Gospels now at Cambridge University) coming via Gaul where the mission paused to deliver letters to various Frankish kings. The group reached England sometime prior to 604 AD for that year St Augustine, with the permission of Saxon King Æthelberht of Kent (aka Ethelbert), consecrated Mellitus Bishop of the East Saxons with London as his seat, making him the first post-Roman-era bishop of the city. Records are scant about Mellitus’ time as bishop but he is believed to have constructed a simple wooden church dedicated to St Paul (the first ‘version’ of St Paul’s Cathedral) in 604 with King Æthelberht as his patron (the ruler of Lundenwic was King Sæberht but, while he was then a pagan and unlikely to welcome the building of a church, he apparently owed his allegiance to Æthelberht as his overlord (Sæberht was later baptised by Mellitus). It was apparently constructed in the ruins of a temple dedicated to the Roman goddess Diana as per the instructions Mellitus had carried from Rome to convert rather than destroy pagan temples. Mellitus is known to have left the city in 610 to attend a council of bishops called in Italy by Pope Boniface IV. He returned with letters from the Pope for the Archbishop of Canterbury, Laurentius (or Laurence), and one for King Æthelberht. There was a crisis following the death of both kings Æthelberht and Sæberht some time around 616-618. Sæberht’s three sons inherited and subsequently drove Mellitus out of the city into exile (Bede suggests it’s because he refused them a ‘taste’ of the sacramental bread but its also suggested he was exiled from his bishopric because the overlordship of the East Saxons passed from the now dead King Æthelberht of Kent to the pagan East Anglian King Raedwald and thus the brothers felt there was no need to allow a Christian bishopric in the city any longer). Mellitus fled first to Canterbury but King Æthelberht’s successor Eadbald was also a pagan and so he continued to Gaul. He was eventually recalled – some suggest his exile was only a year – after Archbishop Laurentius converted Eadbald. Mellitus was not to return to Lundenwic, however, and the bishopric remained vacant for some years thereafter (it wasn’t until 654 that Cedd reclaimed the bishopric). 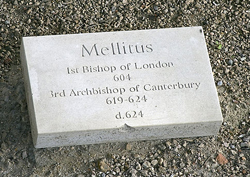 Mellitis, meanwhile, went on to greater things – he succeeded Laurentius as the third Archbishop of Canterbury following Laurentius’ death in 619. During his time as archbishop, legend has it that Canterbury was saved from fire due to his prayers which summoned a strong wind that kept the flames from the town. He eventually died on 24th April, 624. He was buried at St Augustine’s Abbey in Canterbury (the ruins of the abbey remain in the city today). Mellitus, who has a stone memorial at Canterbury Cathedral (pictured), was later elevated to sainthood within the Roman Catholic Church and there was a shrine to Mellitus in Old St Paul’s Cathedral in London.